Temperatures have been chilly and, by the time you see these words in print, winter weather may have made its mark on the Four States. What better time to think ahead to summer reading! I’ve spent the recent grey days anticipating sunshine and combing through titles for next year’s summer reading program. Space is the theme for 2019’s summer reading fun, and the library is preparing to share “A Universe of Stories” with everyone. It’s a rich topic: mechanical space exploration continues with the recent InSight lander on Mars plus next July will mark the 50th anniversary of the first lunar landing. Publishers have noticed, and many interesting books featuring space and astronomy are out there. Take a look at these featured titles for engaging non-fiction with adult and teen appeal. 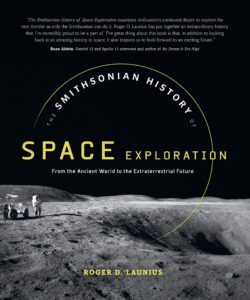 If you like space exploration but aren’t ready to commit to astronaut life, try The Smithsonian History of Space Exploration: From the Ancient World to the Extraterrestrial Future by Roger D. Launius. Don’t let the long title deter you from the interesting content. Chock full of illuminating text and a variety of illustrations, this selection provides a broad look at mechanical and human space endeavors. The book follows chronological order with the first chapter an overview of astronomy and rocketry from ancient Egypt to World War II–a tall order for a single chapter. The rest of the nearly 400-page tome brings space flight from the 1940s to the present encompassing lunar expeditions (the Apollo program), orbital systems (Space Shuttle, International Space Station), and observational voyages in and beyond our solar system (Voyager, Pioneer, Cassini). The book ends with chapters featuring current efforts (Mars, space tourism) and speculating about future possibilities (lunar colonization, interstellar exploration). It’s a lot of ground to cover, but it’s done broadly and serviceably. This title is packed with fantastic illustrations–photographs, diagrams, charts, posters–plenty of engaging eye candy. There are sidebars on various topics scattered throughout along with sections highlighting outer space in pop culture. Offer this book to teens with a passion for space exploration, aeronautics, or innovation history and to adults with broader interests. Approach this book over multiple, short visits for maximum enjoyment; don’t take on the entire universe all at once. Picture books can be tons of fun for all ages. The Planets: Photographs from the Archives of NASA is a fantastic example for the 12-and-older crowd. With text by Nirmala Nataraj and a preface by Bill Nye (the Science Guy), the content pairs perfectly with the rich photographs. Concise, informative captions pack facts with just the right amount of detail plus an observational tone, resulting in readable paragraphs that leave you eager for more without feeling overwhelmed. It’s easy to linger over the amazing photography, enjoying the book in small portions and coming back to it again and again. There is definitely something new to see each time. Or, equally rewarding, indulge in all 251 pages at one sitting. The book is versatile enough to handle either approach. Arranged in solar system order with a chapter for each planet, The Planets includes Pluto in the chapter “Other Bodies of the Solar System” along with the sun, various moons, a comet, and an asteroid. However, NASA’s stunning photography is the real star here. Whether color or black-and-white, the images range from intriguing (“Martian Dust Devil”, page 107) to spectacular (“Venus Transit”, page 34) to achingly beautiful (solar images, pages 208-9). The spread “A Backlit View of Saturn” (pages 150-51) alone is worth picking up the book. Even if you love NASA photography, there’s something to be said for personally viewing the night sky. 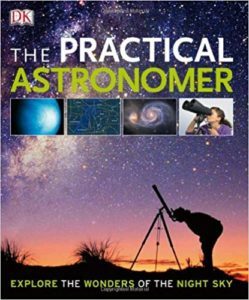 The Practical Astronomer (2nd edition) by Will Gater and Anton Vamplew is a handy tool for doing just that. Published by Dorling Kindersley, this book offers the usual DK goodness–clear illustrations, clean layout, bite-sized informative text, helpful sidebars–albeit in a compact package compared to their children’s titles. The photographs, diagrams, drawings, and artworks shine without overpowering the factual content. Topics include an introduction to celestial bodies, star charts for both hemispheres year round, tips for viewing and recording the heavens, plus valuable reference tables of star stats to aid viewing. My favorite section is “Pathfinders” which introduces constellations from around the globe; each two-page spread shows how to find the sequence in the sky, the location of major stars or objects within it, and the story behind its name. This title begs to be used rather than merely read; it’s a fantastic resource for casual stargazers, budding astronomers, family entertainment, Scout badges, or homeschool coursework. Whether you’re an enthusiast or a dabbler when it comes to outer space, there are plenty of good books on the subject. You can find these and many more at the Joplin Public Library–stop by and try one today!